Brick police arrested two township men Aug. 16 and charged them with multiple vehicle burglaries, police announced Tuesday. Officers Dominick Puccio and Mark Catalina made the arrests after being called to the Primrose condominium complex last Saturday after a resident reported two men utilizing flashlights and looking into vehicles that were parked in the area, said Sgt. David Bedrosian. Upon arrival, the officers spotted a dark colored sport utility vehicle which had the interior light illuminated near the rear of 19 Primrose Lane. “A male subject was observed inside the parked vehicle which had the driver’s side door ajar. A second male subject, dressed in dark clothing, was observed between two parked vehicles,” said Bedrosian. Both men fled on foot when confronted by the officers, Bedrosian said, but the man in the vehicle dropped an item from the vehicle that contained loose change before running off. After a short foot chase, one of the men, identified as Dahkimalik Farod Short, 18, of Brick, was apprehended and taken into custody with the assistance of K-9 Duke and his handler, Patrolman Paul Catalina. Further investigation led to the identity of the second suspect involved, David Jesus Hale Jr., also 18 of Brick. It was also determined by police that Hale had an active contempt of court warrant from the Brick police department for his arrest. Hale was ultimately taken into custody at his residence. Detective Daniel Waleski conducted an ongoing investigation after the pair were arrested, Bedrosian said, during which he was able to ascertain that there were additional victims in the case. 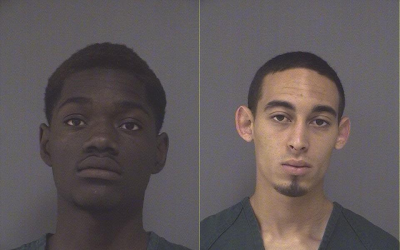 It was determined that the suspects may be connected to a number of vehicle burglaries from the residential neighborhoods of Greenbriar I, Primrose Condominium Complex, Wedgewood and Sutton Village. Some of the items taken during the course of the vehicle burglaries were recovered, said Bedrosian. Both Short and Hale were charged with burglary, theft of movable property and resisting arrest along with other individual charges. Hale’s other charges include shoplifting and hindering his own apprehension, court records showed. Municipal Court Judge Robert M. LePore set bail in the amount of $50,000 cash for both Short and Hale. Both men were transported and lodged in the Ocean County Jail, Toms River, in lieu of bail.